‘Tis the season to celebrate and at Persado we have another reason to raise a glass: We’re turning five on Dec. 12! Since our inception on 12/12/12, we have led a revolution. Through the The Marketing Language Cloud we have used AI to make marketing communications more human. By generating the precise language that most resonates on an individual level, we have connected brands with consumers on deeper levels. And the results have spoken for themselves. We’re proud of the success that our customers, who happen to be some of the world’s biggest brands, have had. They have seen dramatic increases in open and click through rates, not to mention uplifts of more than $1 billion in revenue. Before we blow out the candles, allow us to first indulge in sharing how we’ve helped our customers succeed. Brands, including Air Canada, Humana, the New York Times and Gap have been on the front-end of the AI revolution. They saw the potential early, trusting Persado’s machine learning tools to help them emotionally connect with consumers through email, social and paid media. Take Air Canada, which saw a 220% increase in click thrus after Persado produced the right combinations of language and emotions to inspire action. By connecting with consumers emotionally, Humana saw a 73% click rate lift in a campaign to promote prescription refills. More importantly, it moved members towards a healthier lifestyle. Marketing teams are rejoicing around the world – no longer must they test messages that are “bad” and “worse” but rather they can always find language and emotions that resonate. Through Persado, brands can now access The Marketing Language Cloud to get words and insights to engage audiences more quickly, thereby increasing chances of conversions. We have helped our travel clients drive tens of thousands of potential customers to engage with and sign up for their services. Our retail clients have seen hundreds of thousands of consumer read, engage and buy. We’ve even helped financial clients rise above the crowded digital advertising field to connect with consumers with relevant, powerful language. In the meantime, we’ve freed up time for people tasked with testing messages and analyzing the data, allowing them to focus on bigger ticket items like employee development and the creative direction of a brand. At Persado, the importance of language and emotions — and helping brands emotionally connect with customers — is at the heart of our mission. 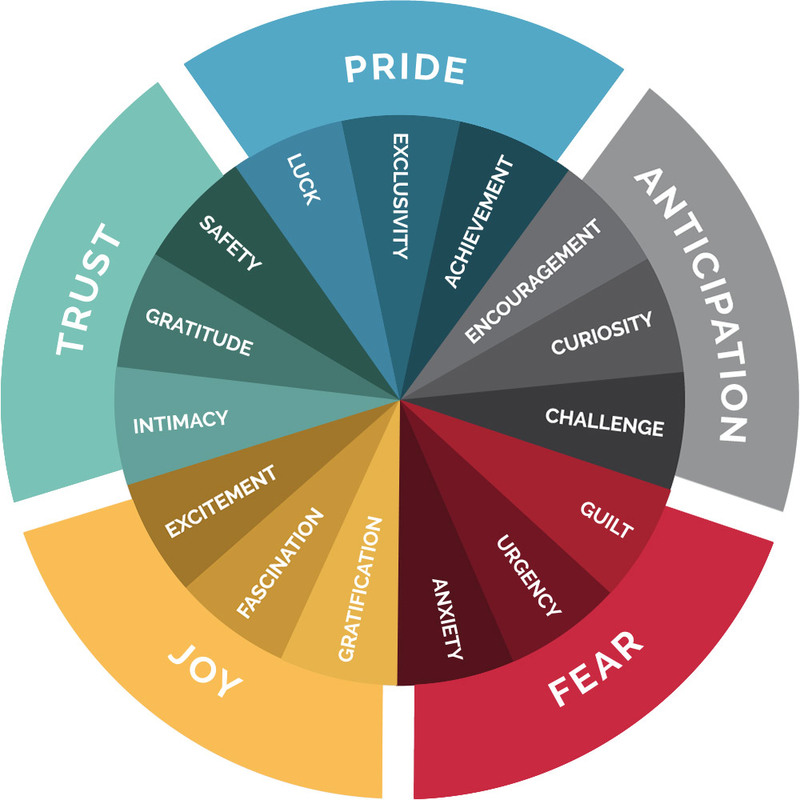 Our wheel of emotion defines 15 emotions for brands to optimize, ranging from achievement (“You deserve this!”) to anxiety (IMPORTANT NOTICE!). This has helped us bring the in-store experience online. In a store, a salesperson can take cues from a consumer and realize she doesn’t want to be rushed picking out the perfect wedding gift for her daughter. The salesperson won’t tell her to “Act now!” because “the sale ends tomorrow!” But that’s what brands often do in email, paid and social media campaigns. By generating marketing language through AI, Persado’s tools find the right language and emotions, making personalization truly human and personal for the first time. Persado’s AI marketing language has generated nearly 50,000 email, Facebook, mobile and offline messages. Through these, our clients have enjoyed a 49.5% average lift in conversions, a 68.4% improvement in click-thru rates and $1+ billion in incremental revenue. One of the world’s leading media brands came to Persado hoping to increase subscribers by using Facebook ads. Using Persado Enterprise, the AI platform generated a photo of two people sitting on a couch in front of a fireplace, which evoked the emotion “safety,” The image had a 181.81% better conversation rate than a less emotional photo of a dinner plate and the brand’s food section. Helping clients segment their email lists to provide the right messages to the right groups of consumers was a huge step forward. But this year, our marketing language AI technology evolved in a way that will help brands take a quantum leap. In October, we unveiled Persado One, a feature that will enable personalized emotional engagement for each consumer for all marketing media types, including social, display and email. Brands will now be able to connect with individual consumers for the first time, further driving sales and long-term relationships. We are looking forward to growing with our current clients and new ones in year six. Join the party and change the game by getting a complimentary analysis of how your marketing currently takes advantage of emotions and compares to your industry peers.